Biofreeze was first introduced to the world by a medical professional who was searching for a way to help his grandmother manage her arthritis pain. The formula he created consisted of the active ingredient menthol with a synergistic blend of inactive ingredients. The resulting formula offered quick, effective pain relief without the use of prescription drugs. 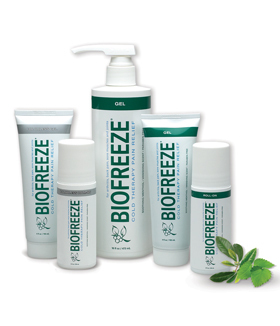 Today, Biofreeze products are providing relief to countless arthritis sufferers. But the pain reliever's unique, cooling formulation is also comforting to sore muscles and muscle sprains; easing back, shoulder and neck pain; reducing painful ankle, knee, hip and elbow joints and helping to lessen effects of muscular strains. Today, chronic health conditions such as high blood pressure, obesity, diabetes, and heart disease have become so common that most people don't remember what it's like to be in excellent health. And if they're not feeling their best, they can't be their best. In truth, many chronic health conditions are preventable. They're the result of years of poor eating habits, lack of exercise, and prolonged exposure to stress. And leading health organizations now tell us that by returning to a healthier lifestyle—by getting the right nutrients, becoming active, and learning to manage the stressors in life—many of these conditions can be prevented, managed, or even reversed. Proper posture can relieve strain on back muscles. Backrests, cushions, and specially designed pillows offer the necessary support. Back and leg braces, knee braces and ankle braces are all designed to suit one purpose, and that's to support joints. We offer a variety of back supports for all purposes: lumbar to support the lower back, upper to help posture, maternity to support mother and growing baby, and magnetic for maximum therapeutic benefits. These back supports provide relief from pressure and pain that can be dehabilitating if left untreated. Protect your back muscles from injury and discomfort using these devices. Supports and braces allow those with back pain to live a more normal lifestyle, letting them bend and lift without the usual pain. SpiderTech tape is a non-medicated cotton tape that you apply to your body wherever it hurts.